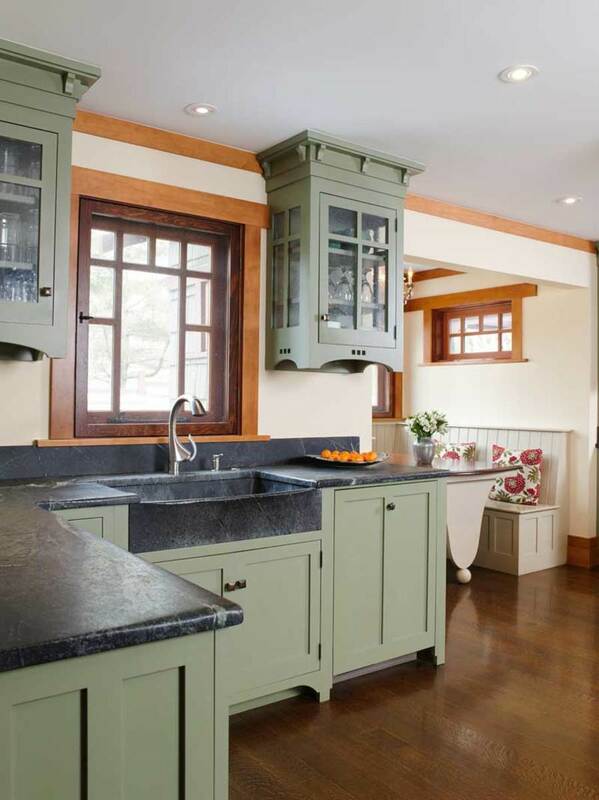 A successful kitchen cabinetmaker made a change to found Bucks County Soapstone. In his line of work, Scott Seuren hears a lot of questions: Can you do this? Have you ever tried that before? 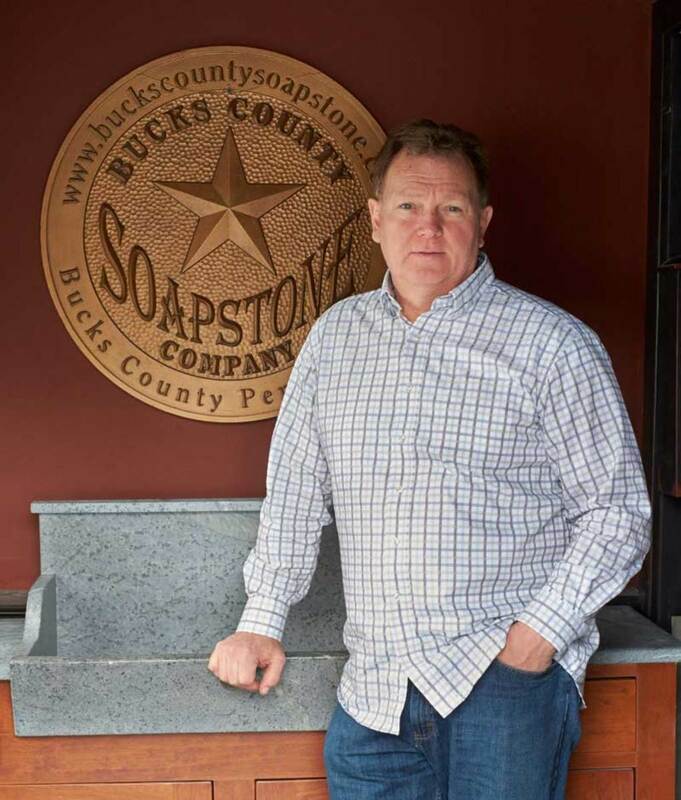 “We listen, and then we turn the question into something tangible,” says Scott, who founded Bucks County Soapstone in 2001 after years as a successful custom cabinet maker. 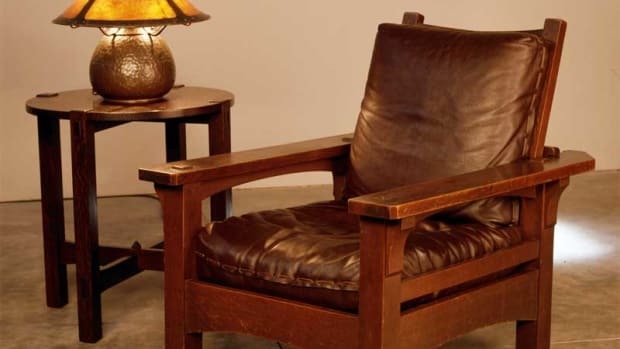 Whatever the request, it’s likely to spark an idea that Scott and his talented team will turn into a unique, hand-crafted product, be it a countertop with rolled edges, a basin carved out of a single piece of stone, or a compass-rose inlay for a foyer floor. 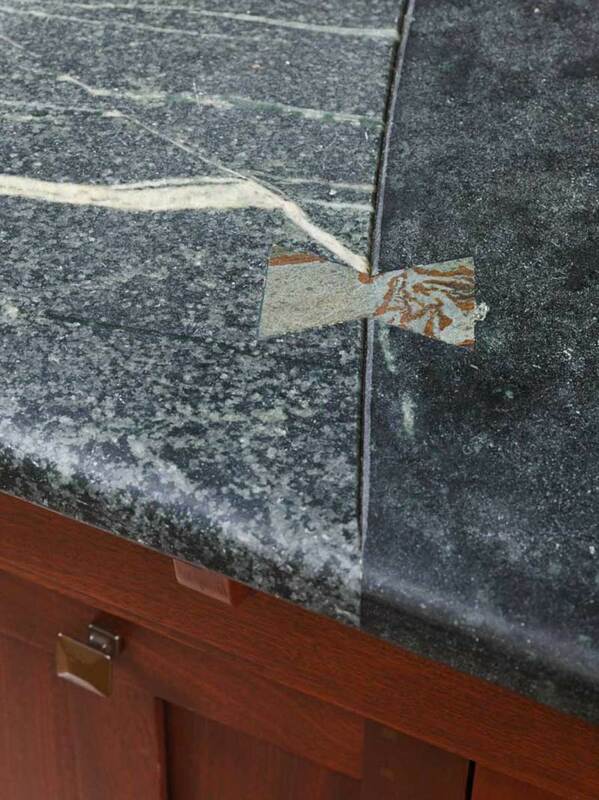 Even a straightforward Bucks County countertop is something special. 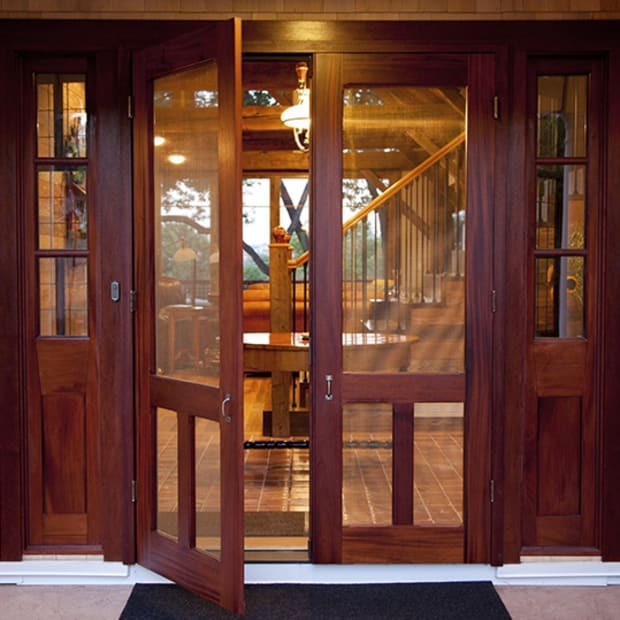 Their standard thickness is a pleasing 1¼". All pieces are cut to order using a template so precise that abutting seams are barely visible. Both sides of the counter are wet-polished so that the bottom edges are fully finished—a touch many other fabricators omit. 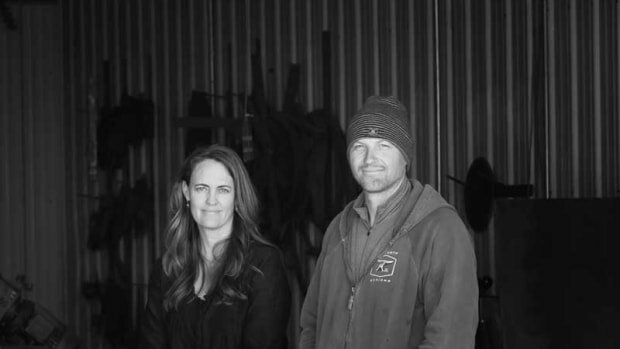 The company works with only quality soapstone sourced from long-standing quarries in Brazil and Virginia. 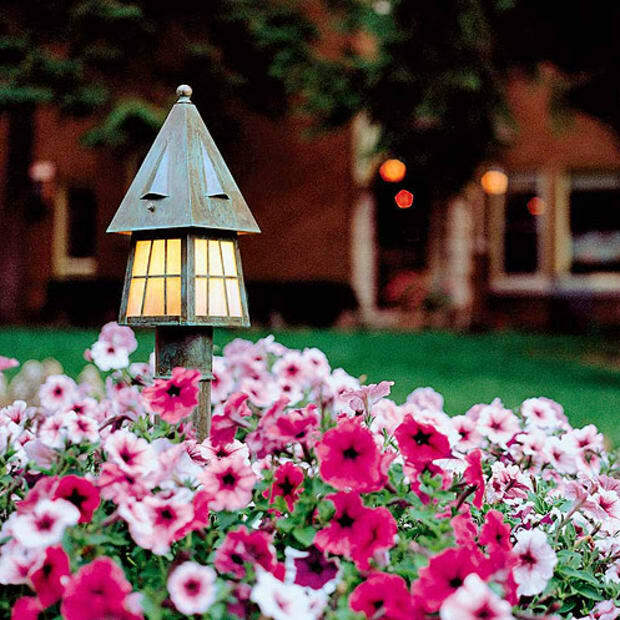 A typical slab is 54" deep and between 99" and 102" long. Colorations range from soft gray to deep gray-green, with typical lighter striations and patterning. 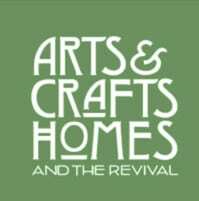 In a newly built house near New Hope, Pennsylvania, for example, designer Bela Rossman of Polo Design Build chose the gray-green stone to complement cabinets built by Crown Point Cabinetry. Soapstone isn’t just for early American kitchens. 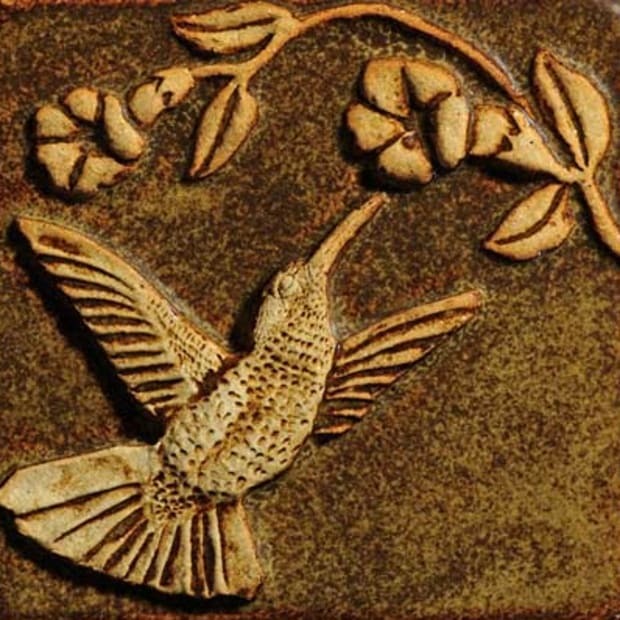 Subtle and earthy, it’s a natural for Arts & Crafts interiors. 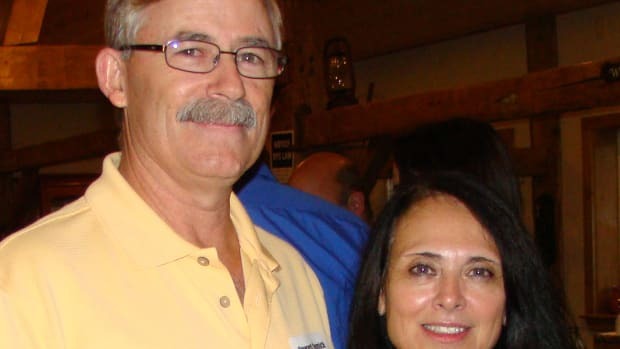 Other custom work includes decorative carving on sink fronts and backsplashes (including letters for verses or sayings), inlays—and drainboards recessed into countertops. The staff of 10 turns out five to 10 large projects a week, generally sets of countertops and sinks for a full kitchen. Smaller jobs are interspersed with larger ones. 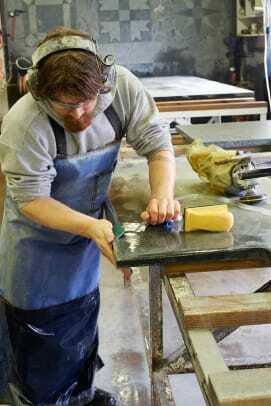 Bucks County Soapstone offers sinks in an endless variety of shapes and sizes, but all are made by one of two methods. Rectangular and square sinks are assembled using tongue-and-groove cuts made with diamond blades and special saws. “Then we hand-set the pieces, just like we were going to make a tongue-and-groove cabinet,” Scott says. The deep groove emphasizes two contrasting soapstone types connected with an in-laid butterfly joint. 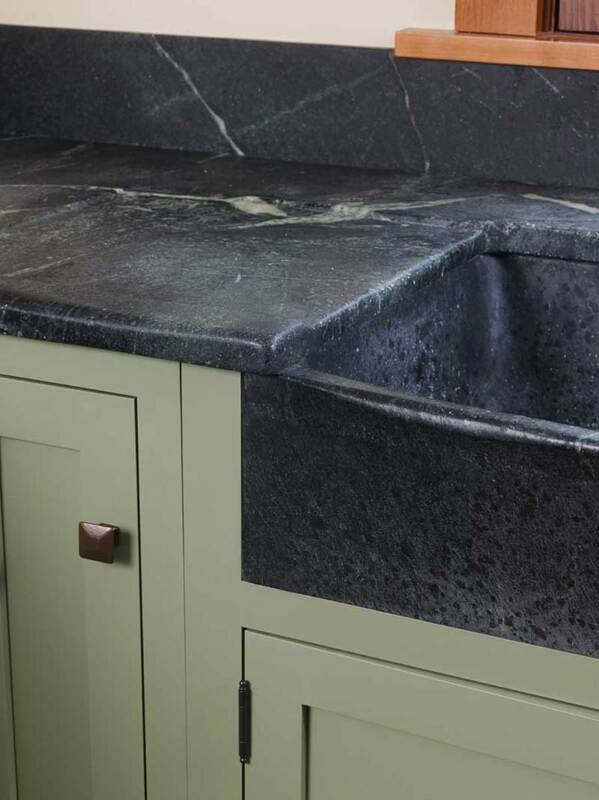 Its block sinks are cut from a single block of soapstone. Shapes include double and single work sinks suitable for kitchens, and oval and round basins for baths. A skilled stone worker uses a computer numeric control machine (CNC) to create a three-dimensional image of the desired sink. Then the worker runs a simulation before any stone is sheared away. When the sink is finally cut, the result is extremely close in appearance to the 3D template. 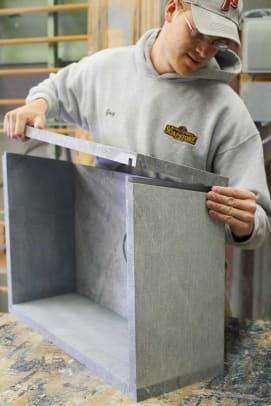 Any stone fabricator will make a template, or pattern, that shows the dimensions of the countertop before it’s cut and installed. Bucks County uses a 21st-century robotic arm called a Faro Digitizer and a computer to scribe every surface digitally. The result is a highly precise pattern that yields extremely accurate results, important when walls and corners aren’t square.